While waiting for a bed at Faith Mission, Columbus, Ohio last night we slept outside on cardboard. At about 4:00 am, a young man was screaming on the side of Faith Mission "Help me! Help me! Help Me!" About five minutes later, I noticed first one, then another, then a third police car show up, turn into the lot by the women's shelter where the trash dumpster, a parking lot, and a bar all are, and then an EMS squad with flashing lights. They all left. The thing is that there was a gang out side also prowling around. I don;t know what occurred in the young man's case who was heard, but the police reacted very quickly - because someone called them. Then, we later heard that this gang and the others who were out there starting rouble were "The Limited Companies" gang. These people too are from New York State - New York, New York to be honest. I 'thought' I heard the Governor of New York State, Governor Quomo, a man who was on television many times to be seen as a responsive Italian Governor of state - that one of the crooks in Ohio around Faith Mission was his son, and that he had no tolerance for this son telling people that he was a multimillionaire or acting out. The Buffalo, NY Attorney General's office already has mutual reciprocity with Ohio in the area of helping with computer crime, if contacted. 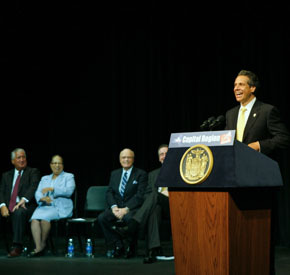 Governor Andrew M. Cuomo travels around the state launching his Regional Economic Development Councils, which will redesign the relationship between the state government and businesses to stimulate regional economic development and create jobs statewide.